Many of you will recognize the name Pink Peril, one of my regular and insightful commenters. It gives me great pleasure to post an account that she has sent me of her experiences at a "Behind the Scenes" tour before the weekend's Australian GP. This is excellent stuff, the real deal of on-site reporting with close encounters of the driver kind. Peril has also been kind enough to deluge me with photographs of the event. I will use some to illustrate her article and feed the rest into the blog as and when appropriate throughout the season. This is a fantastic treat, since original and unseen F1 photos are rare indeed on the internet - a large part of my time is spent searching for such creatures and now Peril has made me photo-rich beyond measure. I cannot thank her enough. As some of you might have heard, the Australian Grand Prix has been under fire of recent years. Falling ticket sales, ever escalating costs of staging, and of course Bernie's demands that we hold the race at a time more 'suitable' to him. 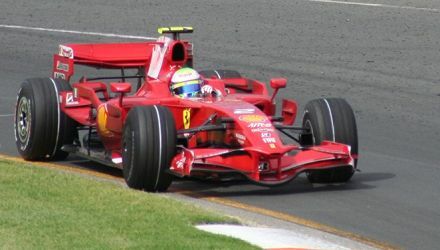 Conflicting TV network coverage saw the extremely popular V8 Supercar support category left off the bill (the local touring cars) which meant that the 2007 GP had the lowest attendance in its 11 year history. This year, the AGPC sought to redress the balance, lest attendance fall even further and place our race under even greater threat. Along with the V8 Supercars back on the bill, they dreamt up a couple of gimmicks to attract the crowds. One was the much touted KISS concert after the race - and believe it or not, some people went just to see KISS - and another one was a "Behind the Scenes" tour on Wednesday, which was open to just 2000 grandstand ticket holders. Being the obsessive rev-head that I am, we put our names down for tickets the next day, and being first in and best dressed paid off, we made the cut! So Wednesday afternoon saw us leave work early and head over to the track going for a personal best of 5 days attendance at the GP! We headed over to the pit lane, on the way passing a display of exotic cars including a Bugatti Veyron. As it was not roped off, I couldn't resist touching it - hey when else am I going to have a $2.5 million car in my hands, so to speak? We tore ourselves away from the exotic cars and headed over to the pits, where to our delight we found we were actually able to walk along the pit lane, and peer into the garages watching the crews at work. Clearly those pit crews don't have much to do with Australians - bits of the cars were lying around, close enough for those of us none too distantly related to convicts to make off with! I contented myself with touching some tyres belonging to Nelson Piquet Jnr - for good luck (I think you must have stolen it all, judging by his race result! - Clive). We wandered along, watching the crews and alternately hopping on the team control panels, which were already partially set up, before security chased us off them. When we got to the very last pit garage of Force India, it was with excitement we noted that Fisi, Sutil and Liuzzi were inside. Luizzi came out and signed a few autographs before the three of them just hopped over the rope and waded out into the crowd. Then they climbied through a gap in the pit lane fence and disappeared off on their track walk with the engineers. After the excitement of finding ourselves standing next to Fisi, we discovered that we were allowed up on the roof of the garages, and climbed up to take a look. All I can say is the people who get to watch from there get the best seats in the house! And we were treated to a bird's eye view of the McLaren car being taken to scrutineering. We then made our way out to the paddock, where one of the local TV networks was making a TV show, one of those filler items for their race coverage. It was being hosted by Neil Crompton, an Australian ex touring car champion who does our local commentary, and Peter Windsor, who I believe you guys will know off Speed TV. 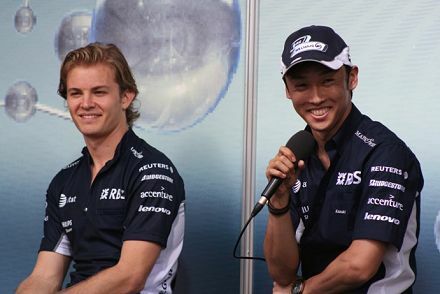 The drivers that were interviewed were Nico Rosberg, Kazuki Nakajima, Mark Webber, Nick Heidfeld, Robert Kubica, Giancarlo Fisichella, Adrian Sutil and Timo Glock. As it was a fairly relaxed setting, all the drivers were clearly enjoying themselves, and there were plenty of laughs as the hosts, and the audience asked them questions. Among the topics discussed were Melbourne's future, night races, the loss of TC, Kubica's accident in Montreal, Nico's love of surfing and what path you have to take to become an F1 driver (asked by one particularly keen 12 year old). Sadly they all predicted another two horse race for this season. Great account Pink Peril, it made for insightful reading. Thanks Pink. That was a piece of pure reporting beauty. Please send in more for us to read, if you could get Clive to post it. I thought the KISS concert was kinda weird too...not the idea of a concert before racing, as F1, like superbowl is an "event" and a "show" but KISS? aren't they ancient? The only driver who probably remembers collecting dinosaur bones with them is David Coulthard. 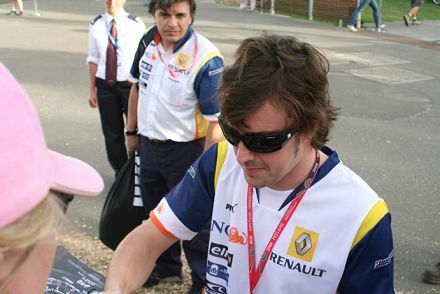 BTW, PP, Alonso looks strangely happy and content for a driver who won't win a thing this year. Maybe it's that $46 million and future Ferrari drive. Thanks guys ! It's nice to share with people who are as fanatical as I am about F1. A lot of my friends follow it but not to the same extent I do and probably get sick of me banging on about it, whereas I know you guys never will ! Barry, that photo of me (well, half of my head) with Fernando was taken on Friday and he was in a very good mood then. Much more relaxed and happy than when I saw him last year. The actual photo he posed for with me was on sunday night after the race and he wasn't as cheery - but then he is never satisfied with anything other than the top step of the podium - even if he did do an absolutely fantastic drive. Still, he stopped for a photo with me - the only one too, I might add - clearly I am his favourite fan - and that's all I care about ! I am happy to write a bit of a story about my time at the track - I'll try and get onto that tonight and send it over (although tuesday is my night for walking around Albert Park and who knows - I might just head back over to the back of the pitlane and relive the moment !) and don't forget I will also be attending the Singapore GP this year so can post an eye witness account of that race too. PS I forgot to say that all the photo's supplied were taken by Mr Pink - thanks Honey ! All contributions gratefully accepted, Peril. And thank you, Mr Pink! Does Mr. Pink work for a F1 team? Asking this to know if I can expect posts like this through the year, or if Australia was the only lucky one. If the latter is the case, we can ask F1 fanatics to do something on simliar lines for each race (local for them!). It's Mrs Pink, actually, although Mr Pink takes the photographs. I am exploring Mrs Pink's thoughts on continuing to write the occasional piece, even though I don't think the Pinks will be able to attend any other GPs this year - they are Australians, and so Melbourne is fairly local for them. Mrs Pink writes so well that I would be happy to have future pieces on her thoughts regarding F1 in general. As regards other GPs, I am always grateful to receive contributions from fans who have attended GPs and are prepared to share their experiences with us. And that means I'm asking for something on the Canadian GP, Arun! Sadly no, Mr Pink does not work for an F1 team - we both work in Insurance (about as dull as it gets !) Mr Pink is just an extremely keen amateur photographer, whilst I am an aspiring writer. We are both rev heads, so it's nice we can work together on this ! Arun, as much as I would love to attend every GP live that is sadly out of our reach, but we will be attending the Singapore GP also this year, so I am happy to play roving reporter there too. Good Day. Poets have been mysteriously silent on the subject of cheese. I am from Egypt and learning to write in English, please tell me right I wrote the following sentence: "Millennia insurance lead generation system." With respect :-), qualified insurance leads.